What follows is the 5th of eight disaster lessons from site. We ask what went wrong and review what we’ve changed in our practices to prevent it from happening again. An archive of the series can be accessed here. The opening trades of construction proceeded rapidly, on or even a touch ahead of schedule. Excavation, the concrete floor slab, framing and roof cladding were all finished within two months. But towards the end of this period, we made a late change a key trade. This would mean an unavoidable pause in progress while the relevant fabrication took place. The builder found other work to fill the gap, getting started on a second project. He was transparent with us, though really what else could we expect? It was perfectly reasonable that a four week lull would need to be filled so he could keep his staff busy. What we hadn’t expected though was that the new project would take over the builder’s attention as his primary focus. While the quality of his work on ours never suffered, from that point onwards progress became sporadic at best. During the finishing trades, the project barely limped along. The pause was enough to permanently disrupt the broader organisational focus of the builder. Managing the flow of work on site is an intense and continuous exercise that demands a builder’s full attention, attention he no longer had to give. He was now required to balance the competing demands of two sites, located at opposite ends of Melbourne, both in terms of anticipatory scheduling and on-site staffing. It was a task that proved too much for him: excuses began to creep in and milestones were repeatedly postponed. Perhaps central to this was the cause for the disruption, that is, a change we and the client introduced. Our change was not something the builder had anticipated, and he was forced to cope with it on the fly. Though it was not discussed from that point onwards, it’s possible the delay became something like an excuse for him. He could let another week slip because, after all, it wasn’t his fault he had to get started on a second job. A builder is a small business operator. He has staff and overheads, both of which need to be paid every month. As mentioned previously, he also has to manage large volumes of cashflow to earn his income. He needs to stay busy or he’ll sink. A significant delay, no matter what causes it, will mean a builder has to take himself and his staff elsewhere to fill the gap. The lesson we learnt was to ensure all our critical decisions are made with enough time for the builder to proceed with his works on schedule. We may not be able to control every external delaying influence on a project, but the least we can do is remove ourselves as one of them. 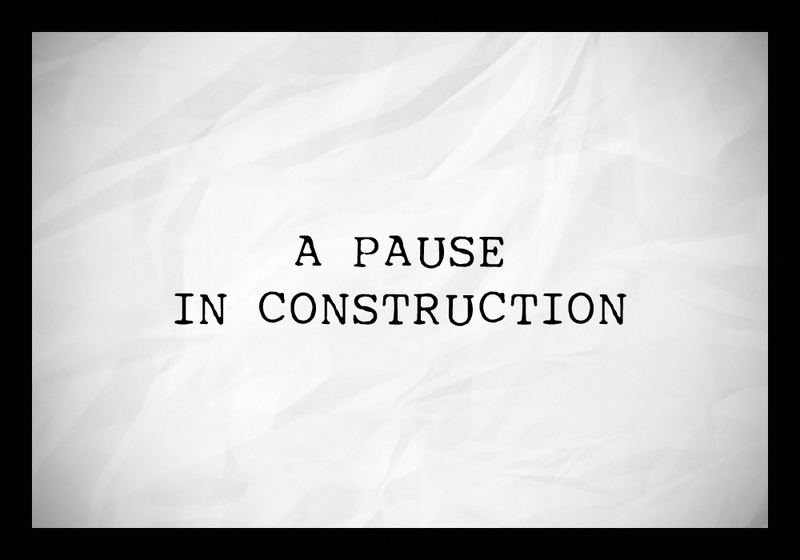 A pause in construction, author’s own image.